Steel King Industries, Inc., a leading manufacturer of material handling products and systems for improving operational efficiency, will be highlighting its SK2000 closed tube roll-form rack systems at ProMat 2019, to be held April 8-11, 2019 at McCormick Place, Chicago, Illinois. Visit Booth # S2434 to talk with experts about the SK2000 product line, which offers the strength and durability to provide the framework for multi-level pick module/distribution centers. The SK2000 line is ideal for a wide range of warehouse applications and markets, including food and beverage, retail, agriculture, and automotive. 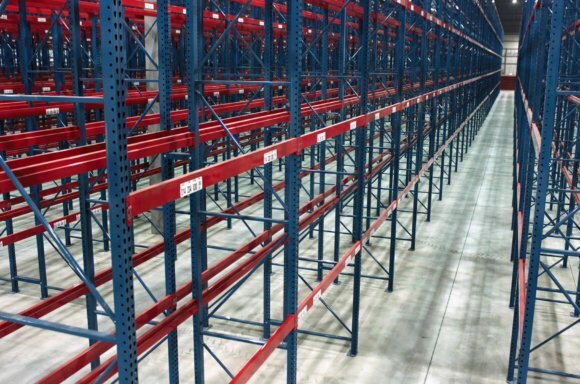 Steel King works with customers to analyze their unique pallet racking needs and customize each SK2000 rack system configuration to meet operational goals. In addition to providing the rack system, Steel King offers engineering services to ensure the system works with conveyor and robotic systems. Featuring a fully welded tubular upright, the SK2000 racks on display offer superior impact resistance over open-back style uprights. Use of roll-form steel makes the SK2000 cost-effective for small storage applications. The strength of the SK2000’s closed tube beams and upright rack frames make each rack system safer and more functional. Independent engineering tests have confirmed that SK2000 pallet racking has 250 percent greater frontal impact strength, 68 percent greater side impact resistance, and 44 times greater torsional strength (resistance to twisting) than the open-back column style. SK2000 columns have a unique 90 degree bend and no corner holes. The SK2000 is a boltless rack system with teardrop connections and auto-engaging safety locks, so it can be assembled without tools. Easy, boltless assembly of the system enables more flexibility for any future adjustments. Columns are available in multiple sizes and thicknesses according to application needs. The system’s braces and step beams are made from the same high strength closed tubing as the columns and are available in many profiles and lengths. Bracing is secured with full fillet weld, which in many cases is four times more weld than competing rack systems. Steel King also offers additional safety and durability accessories for the SK2000 rack systems, including factory-installed column core inserts that can stand up to demanding applications with frequent forklift loading and unloading. For more information about Steel King and the SK2000 closed-tube roll form rack system, visit: https://www.steelking.com/products/pallet-rack-boltless-closed-tube/. Delivered straight to your inbox . . .